1. Establish "question standards" in the same way you have "coding standards". Creating a framework for how questions should be asked gives your devs a way to help each other without just supplying direct answers. Instead, they can help someone who's struggling by guiding them towards a well-structured question. Sometimes the answer even emerges from that process organically. Careful not to become zealots about this. 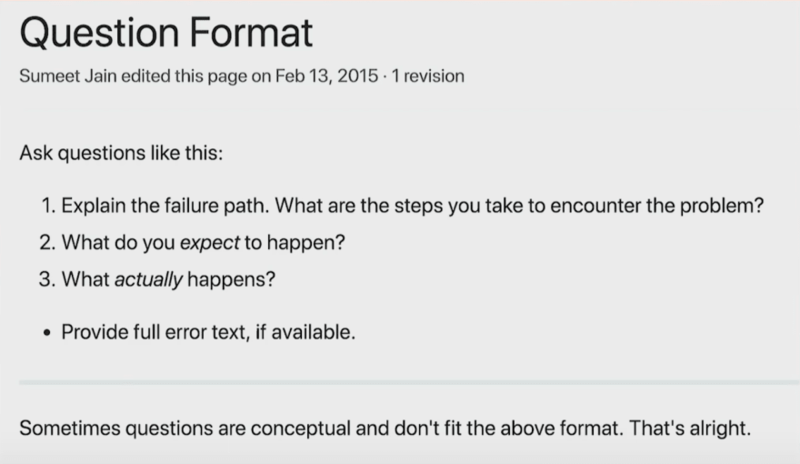 If a person is struggling with the question format, make time to help them on their terms. 2. Discourage private messages in Slack. If a dev has a question, they should ask it in a channel that the relevant audience can see. Making more questions visible sends a message that questions are normal, even from more senior folks. Here's a direct quote from our Slack: "Well, since this channel's a bit more lively now, I have a question." This also results in more devs knowing about pain points. Part of improving mentorship is being aware of what's difficult. Otherwise, it's easy for devs to underestimate the complexities in your systems/processes. Omaha-based product engineer, educator, and speaker. Completely disagree w/ #2 :P -- in my experience, Slack is the online equivalent of an elementary school cafeteria (could write a post about that too), so for focus' sake I'm very particular about what I pay attention to. I'm much more likely to answer a PM and follow up in person than to start a conversation in a larger channel. What are your question standards?